It is a legit question. A question most employers and booth owner ask themselves, and most conclude with “a ladder will do just fine” inside my spray booth. A conclusion which may not reflect the fact that falls from portable ladders (step, straight, combination and extension) are one of the leading causes of occupational fatalities and injuries (source: United States Department of Labor: Occupational Safety and Health Administration (OSHA) 2017). Ladders are easy to use and convenient in most environments. 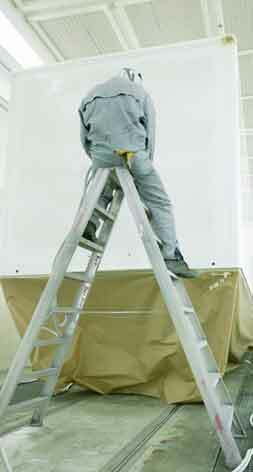 However, accidents also easily come along with the use of ladders. By replacing the ladders with a 3D telescopic man lift inside the paint booth, both the production and safety will increase. A study done in 2007 by the Australian Government: Australian Institute of Health and Welfare, showed that the head injuries related to fall from ladders counted for approx. 12 per cent. Which proves that ladders represent both fatalities and serious injuries. What does the governing bodies say? There is no doubt that governing bodies will continue to focus on safety at work. . There will not be any compromise on any safety aspects in any industry. They will even become more complex and strict, and the consequences of neglecting the laws and regulations will be higher. Article 153 of the Treaty on the Functioning of the European Union gives the EU the authority to adopt directives in the field of safety and health at work. Member States are free to adopt stricter rules for the protection of workers when transposing EU directives into national law. Therefore, legislative requirements in the field of safety and health at work can vary across EU Member States. European directives are legally binding and have to be transposed into national laws by Member States. Similar OSHA (US) is also issuing directives on how one should comply to safety regulations when doing work at height. Why compromise on safety, when you can have both better safety and efficiency inside your spray booth? Looking at an investment you should not just look at the top number of the investment and make up your mind directly, but seek what that investment will bring to the table. It is good business to invest in safety of your employees and to have a general safe work environment. And if that investment also provided you with an increase in the efficiency in the spray booth, it would also increase your profits. Increased safety and increased profits. Would you turn it down? If you could avoid any accidents it would keep your work stock stable and limit the absenteeism in your company. A report from Liberty Mutual published several years ago, found that indirect costs associated with increased absenteeism, worker replacement and productivity loss can cost up to two times as much as the normal costs (source: EHS Today). This is not an exhaustive list of considerations which needs to be done, but it shows that if you are to do much work at height, many considerations must be done. And by following all the laws and regulations, the booth will not be very efficient when using ladders as main component for getting work at height done (source: SHP 2017). Look to the market for a more efficient way of preparing and/or painting your objects; bus, truck, train, tram, cv etc in a safer manner which is compliant to the laws and regulations. 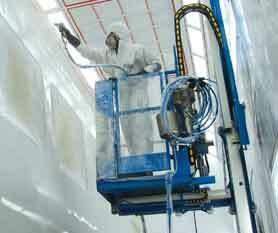 Look for the certified solutions and compliant solutions to the ATEX-environment a paint booth is a part of. Not only will you ensure a safer work environment, but the workers will be able to work longer hours as they will not tire as quickly as they will when working from a ladder, and more work can be done as you can mover the operator into various angels and position much quicker. The latter represents higher profits, making your company more profitable and your customer happier and not to forget, the workers more effective and safe. Reglo AS manufactures the pneumatically operated access platforms WALL-MAN® and LIFTMAN™ (3D telescopic man lifts) for worldwide distribution. The man lifts have been exported to over 40 countries worldwide. Reglo AS has trough decades provided man lifts compliant to the laws and regulations for work at height inside a spray booth. It has provided solutions to all kinds of segments in the spray industry: bus, truck, train, trams, cv, military, transformation, blades for windmills etc. Reglo AS uses a third part notifying body for compliance to laws and regulations, in contrary to other man lift manufacturers who does this themselves. For the CE certification TÜV is the notifying body. For the UL certificate, UL is the notifying body. Reglo AS is ISO 9001:2015 certified. Today is the source for environment, health and safety best management practices including workplace safety, OSHA and industrial safety and hygiene in the US. Works to assure safe and healthful working conditions for working men and women by setting and enforcing standards and by providing training, outreach, education and assistance in the US. The Australian Institute of Health and Welfare (AIHW) is Australia’s national agency for health and welfare statistics and information. EU-OSHA is the European Union information agency for occupational safety and health. Their work contributes to the European Commission’s Strategic Framework for Safety and Health at work. SHP is the first for health and safety news in the UK. It meets all the content needs of a health and safety professional, with breaking industry news, in-depth features, in-court stories, legislation updates, eBooks and the latest industry products. This entry was posted in News, Wall-man and tagged safety, Spray booth, Wall-man, work at height. Bookmark the permalink.